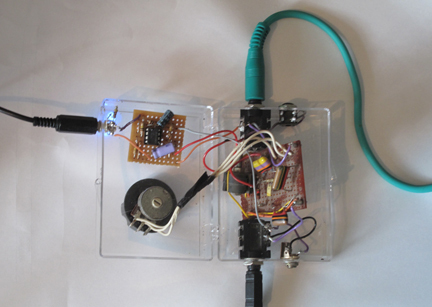 In my previous post Theremin 1, I described an optical theremin circuit which was ultra-simple – and worked! However, I described how once I had finished it and played with it for a while, I realised there were some slight problems in being able to play it effectively; and also began to wonder how I could make it sound more interesting and varied. This post describes what I did to finish it off. The solution I came up with to make it sound more interesting was based on something I’d seen on a couple of Lunetta-related websites: a 4040 divider outputting several octaves at once, which could be individually selected and mixed together to create the final waveform. 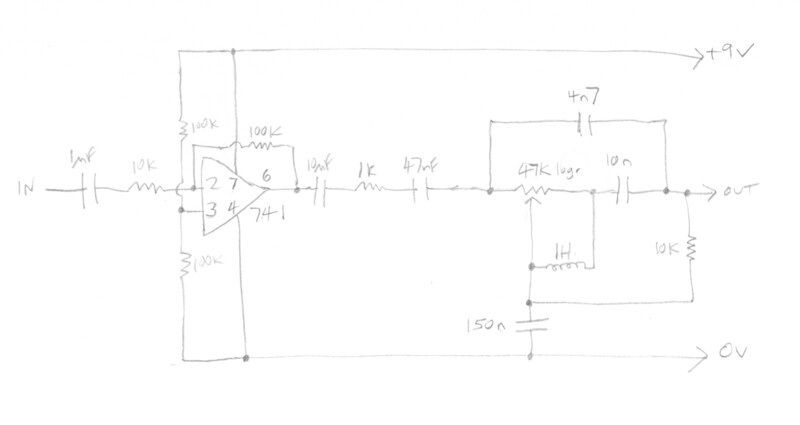 I reduced the value of the timing capacitor in the original circuit from 22n to 15n to make the basic pitch a little higher and connected the 4040 between the output of the oscillator – pin 2 of the 4049 – and LDR2. Together with the direct output from the oscillator, I used the first 7 outputs from the 4040, covering 8 octaves overall – a rather excessive range, but the pitch variation obtained using LDR1 was very wide, and I figured the highest and lowest notes might be needed at some point – contributing to the tone, even if not the main pitch. The 8 different octave outputs were connected together via SPST switches, and various combinations of octaves did produce a surprising variety of tones. Just one more thing was needed, I thought, to maximise the availability of square waves at 8 octaves, and that was a filter. 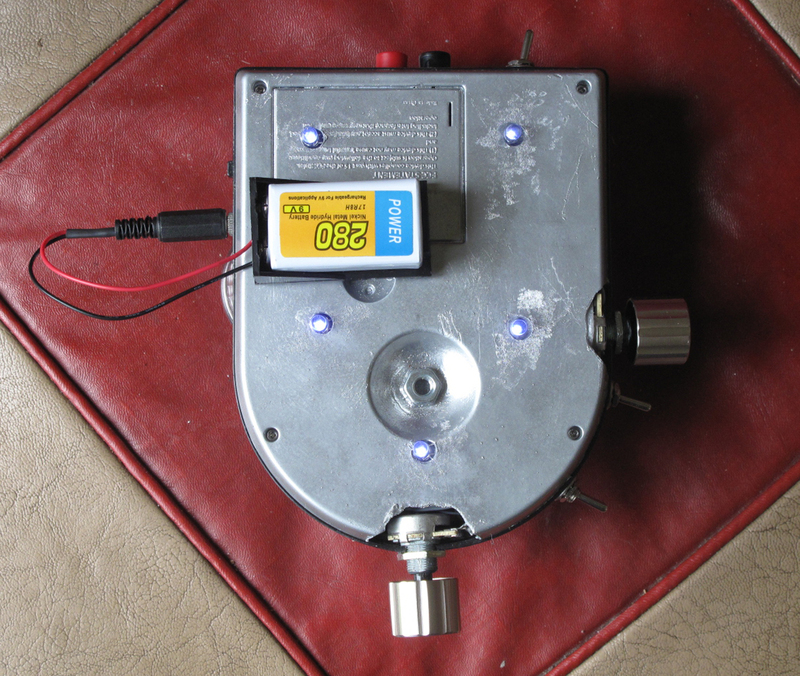 I’ve written elsewhere in the blog about Ray Wilson’s simple-but-effective 741-based low-pass filter from the Music From Outer Space website, which I liked so much I built two of them: one of them as a stand-alone unit (Active low-pass filter); and the other one here in the Optical Theremin. The only difference was that in this case I replaced the cut-off frequency control with another LDR (LDR3). I discovered afterwards that I hadn’t used the most up-to-date version of the circuit, but adding the extra cut-off frequency fine adjustment and resonance control (the extra features of the revised version) would have been too much. As it was, I already had 3 LDRs, and only two hands to operate them with. I added switches to select between the two volume and filter LDRs and two potentiometers, which would enable one of them to remain constant while the other one was manually controlled. The reason for passing the output of the 4049 oscillator (at pin 2) through two more stages (spare ones in the same 4049) was to give it the same power as the outputs from the 4040. Using the signal from pin 2 as an output as well as feeding the input of the 4040 seemed to be too much for it, and it wouldn’t work. 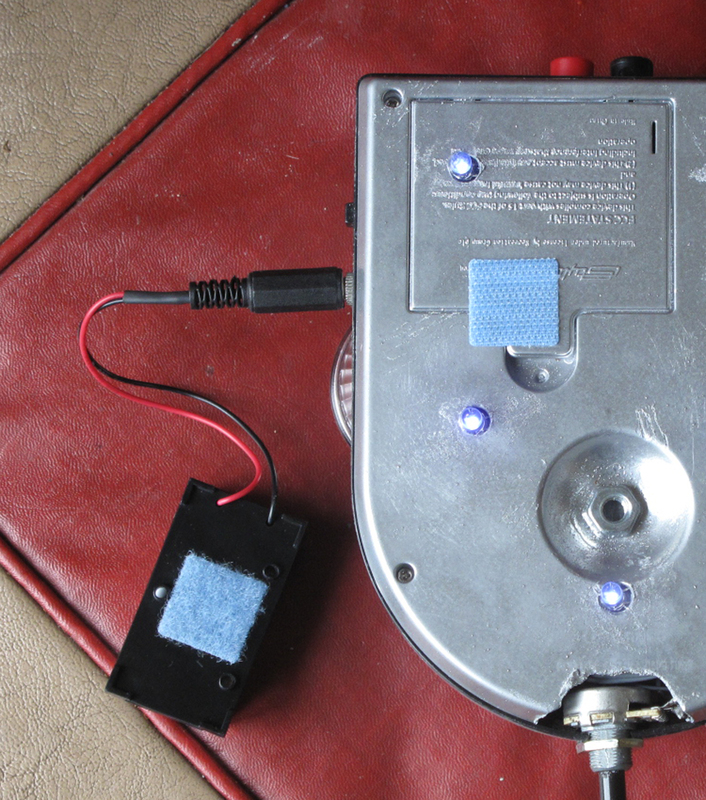 Also – as I had done with a couple of recent instruments (for example, the Cracklephone) – I added a pair of banana sockets, so a larger external speaker could be used. Not shown in the diagram is a switch to cut out the internal speaker when these sockets are in use; and a similar arrangement to the Cracklephone, two 3.5mm sockets where a small goose-neck microphone can be attached. 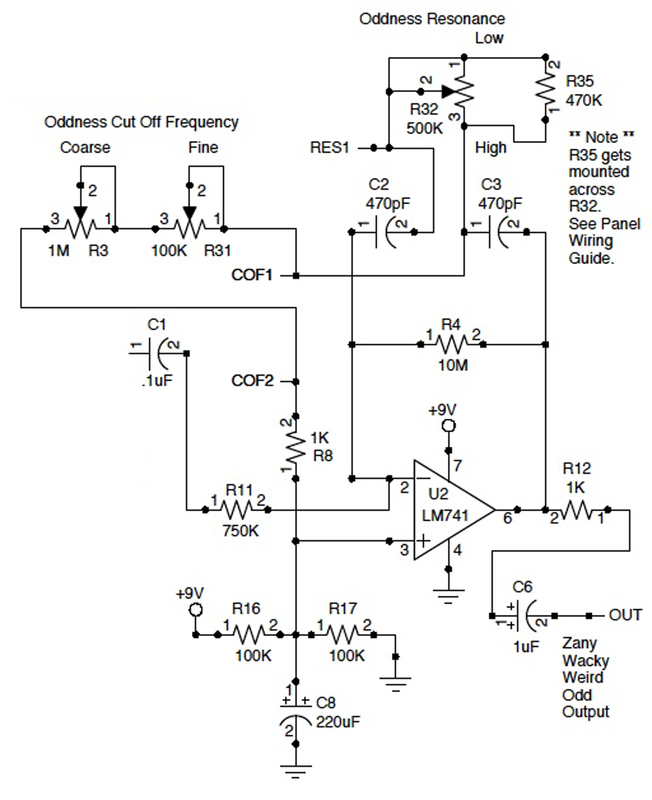 This is not part of the Theremin circuit, and is the nearest it gets to having a line-out. This what the inside of the case looked like just before I put it back together. I don’t recommend you try and stuff so much inside a small case, as I always seem to be doing. As for the physical construction of the instrument this presented one or two problems. The one of most interest concerns the LDRs. Electrically, these seemed to work perfectly; but the problem with them is they’re so small, and it’s very difficult to make subtle changes to the amount of light falling on them with a large human hand. 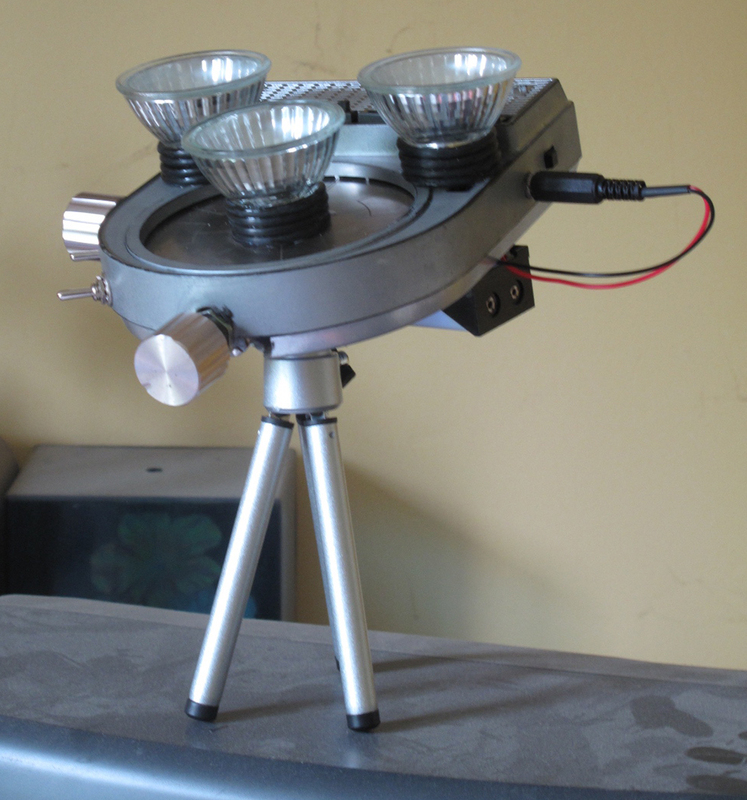 This is a perennial problem with these small-sized LDRs, and what I decided I needed was something like a torch or spotlight has to widen the spread of light – a dish or reflector, which would effectively increase the area the hand would have to cover in order to restrict the light falling on the LDR. 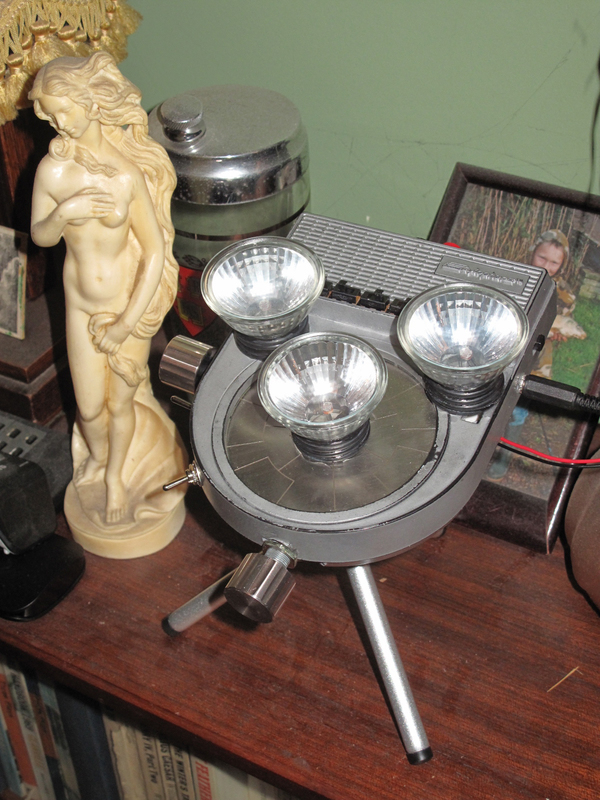 Having thought of torches and spotlights, I reasoned that I could use MR16-type spotlights, remove the original bulbs, and fit the LDRs inside. 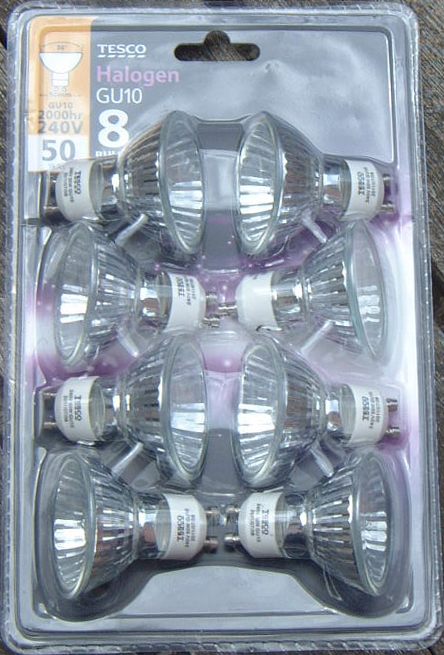 These MR16 (or, with a different fitting, GU10) bulbs can be expensive, but my local Tesco’s was selling a pack of 8 for £1.25, so I bought those, and got to work on them with a hammer. I’m not saying I did a neat job – and I damaged a few of the 8 in the process! 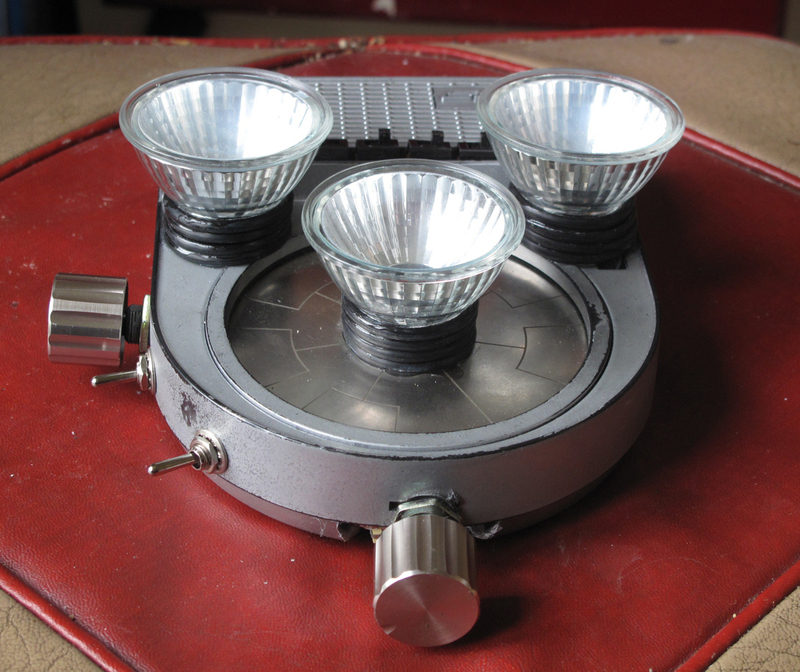 – but I ended up with three reflector housings for my three LDRs. Knocking off the fittings was easy, but getting the bulb out was not: these things are evidently put together before the glass front is attached, as the bulb is considerably larger than the hole through which the electrical connections pass. At first I tried knocking the bulb through into the body of the reflector and breaking it up – a procedure not dissimilar from that of the Egyptians, removing internal organs through tiny holes before the process of mummification – but that proved impossible to achieve without breaking the glass front; so in the end I just broke open a hole large enough for the bulb to come out of. My original intention was to drill holes in the Theremin case large enough to insert the end of the reflectors, and superglue them in place, but in the end the hole would have to have been an inch (25mm) wide, and there wasn’t enough space inside the case to insert something this big. So instead I mounted the reflectors on the surface. I built up a sleeve for each one using 25mm inside diameter O-rings. These were about 3mm deep, so 4 of them superglued one on top of another were enough to support a reflector. More superglue ensured that the reflectors stayed in position, and that the LDRs, passed through a hole under each reflector, were in the right place. This picture of the back of the instrument shows an arrangement I’ve used in quite a few cases where there wasn’t enough room for the battery inside. Close to the power socket I’ve stuck a square of velcro, and the battery holder sticks to this. Having a battery stuck to the bottom wasn’t a problem, as the instrument wouldn’t be resting on it: the 1/4″ Whitworth nut, glued over the hole through which the Beatbox tuning pot was accessed, is the attachment for a mini silver tripod which I managed to get hold of for 99p on eBay. This would allow the theremin to be raised from the table top and set at the best playing angle. I think the tripod gives it a futuristic look – or at least what was considered futuristic in about 1940 . . . I adjusted the original tripod between these last two pictures to allow the feet to spread out a bit wider, as it was a little unstable, especially with the battery velcroed to the outside. This just involved a little sawing and cutting and it now stands much better without being in danger of toppling over. Apart from the Stylophone, another instrument I’ve always been fascinated by is the Theremin, and I’ve always planned to make one. I know the project I’m about to describe isn’t a proper theremin, but it has an oscillator, and pitch and volume are controlled by hand without touching it – which are amongst the essential features of a theremin – so it seemed like a good place to start. The Theremin is an electronic instrument named after the man who invented it in Russia in about 1920, Lev Sergeyevich Termen, It’s called the Theremin, not the Termen, as Leon Theremin is the name by which he became known when he came to America in the late 20’s – probably a better representation of the family name, which is not Russian in origin, but French. Theremin disappeared back to Russia after just a few years, and did not reappear in the West for over 50 years (1989, by which time he was 92 years of age! ), but left designs for his instrument which were manufactured under licence by RCA. As I see it, there are two essential features of the theremin, pertaining to how it is played, and – more technically – how exactly the sounds it makes are produced. First of all, as mentioned above, it is normally played without touching it: instead, pitch and volume are controlled by moving the hands nearer to or further from antennae – like radio aerials – on the instrument. This is a pretty unique feature, and came about because Theremin invented it not while trying to make a musical instrument, but in the course of obtaining an audible response to scientific experiments he was conducting at the Physico-Technical Institute in Petrograd (St Petersburg). The classic theremin features a vertical, radio-like antenna for pitch control (played by the right hand), and a horizontal loop (played by the left hand) to control the volume. Secondly, the notes produced by the theremin do not come from the output of a single oscillator: instead, it has two oscillators, which run at radio frequencies (RF), and are too high to hear. However, if there is a difference between the two frequencies, this produces a third tone, which is much lower and which you can hear. When the player moves nearer to or further from the antenna, this alters the difference between the two high frequencies, and raises or lowers the audible tone. It is typical to hear melodies played on the theremin which feature a great deal of portamento – sliding from one note to the next. This is almost inevitable, as there is nothing to guide the player to find the correct note, other than their ears. Skilful performers can avoid doing this all the time, but it would be a terrible waste not to make a feature of it, since the theremin makes it easy. It is typical, although not a necessity, for melodies to be quite high-pitched, and players will usually employ techniques that produce vibrato. 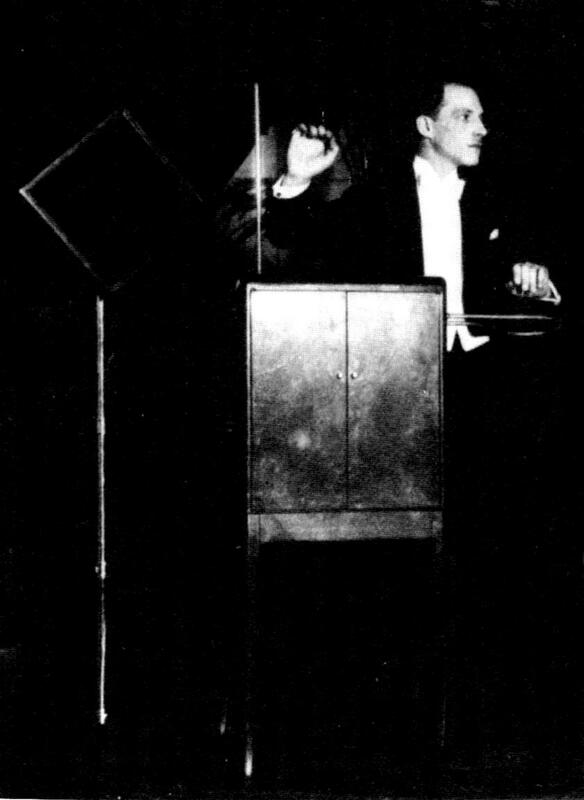 These typical theremin sounds – often described as ‘ethereal’ or ‘spooky’, and frequently found in horror or science fiction contexts – are a product of the two important design features described above. Other instruments have been designed which mimic the sound of the theremin (including my recent SoftPot Stylophone), but unless the sounds are produced by the player’s proximity to the instrument, using the body’s natural capacitance to affect the pitch and volume of RF oscillators, it isn’t a proper theremin. The Electro-Theremin or Tannerin, developed by Paul Tanner and featured on the Beach Boys’ Good Vibrations, was such a good imitation that people used to think it was a real theremin; but it was controlled by a slider. According to Google, today would have been Robert Moog’s 78th birthday. As you can see, they’ve illustrated this with a (functional!) version of his famous synthesizer. Before inventing this, however, young Robert was heavily into theremins, studying the Leon Theremin-designed RCA model and inventing his own – proper – instrument. 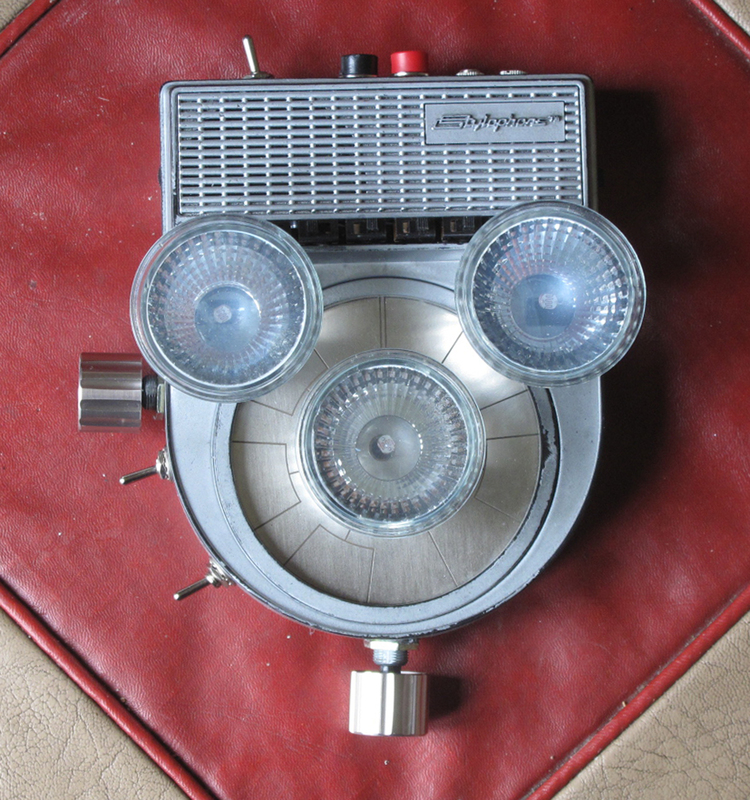 It’s not entirely a coincidence that my SoftPot Stylophone – and the earlier Cybersynth – sound a bit like a theremin, but this was the first time I’d constructed an instrument meant to be played without touching it. 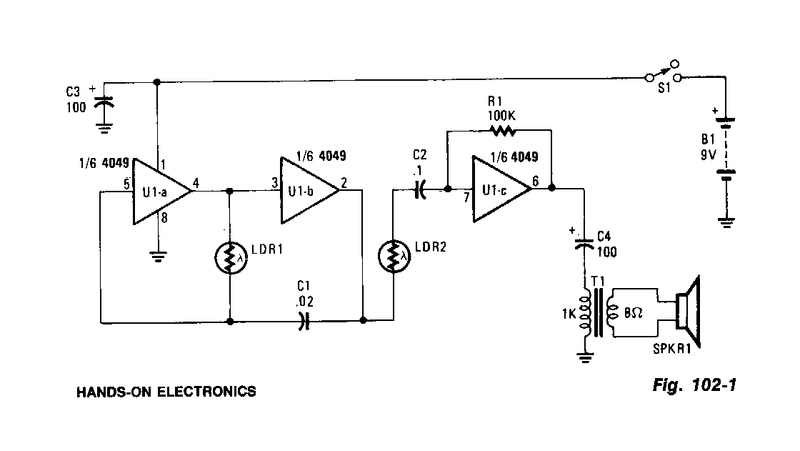 This circuit came from Graf’s Encycopedia of Electronic Circuits (Vol. 5, I think), but seemed to me to have something of the look of a ‘Lunetta’ device about it. I’ve already digressed into the history of the theremin, so I’ll save discussing Lunettas for another time. (If you don’t know what a Lunetta is, start here: https://docs.google.com/document/edit?id=1V9qerry_PsXTZqt_UDx7C-wcuMe_6_gyy6M_MyAgQoA&pli=1#heading=h.6a4696420d74 and here: http://electro-music.com/forum/index.php?f=160). Anyway, I was sure I’d seen the 4049 chip on which the optical theremin is based being used in Lunetta circuits. I had all the parts to hand – including the 4049 which I had recently salvaged from a project board I’d put together so many years ago I’d forgotten what it was originally for; and even the transformer, which I’d recently bought for another project – and it fitted on a 1” square piece of veroboard tucked inside the case of one of the broken Stylophone Beatboxes I had acquired. It was ultra-simple – and it worked! However, once I had finished it and played with it for a while, I realised there were some slight problems in being able to play it effectively; and I also began to wonder how I could make it sound more interesting and varied. 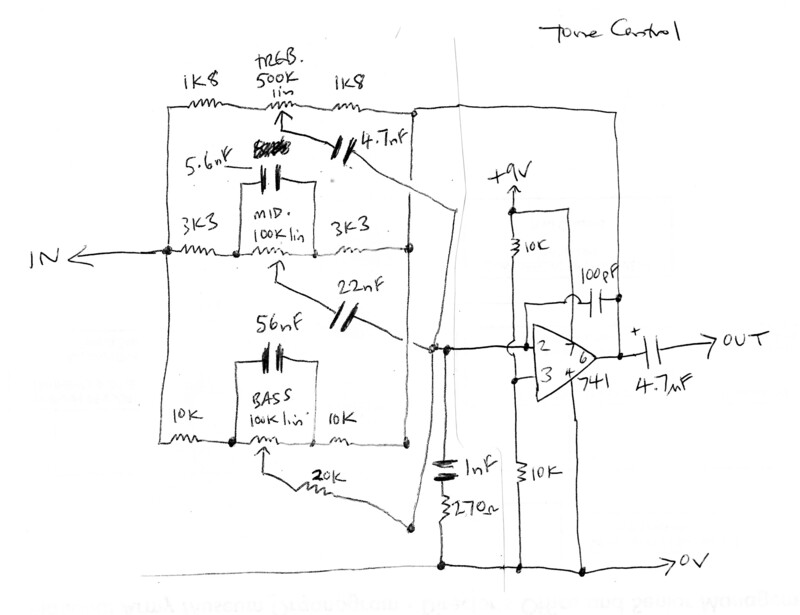 I’ll describe my variations on the basic circuit in a follow-up post. Information on Leon Theremin comes from Wikipedia and Theremin: Ether Music and Espionage by Albert Glinsky (Foreword by Robert Moog). The Wikipedia article has a number of very useful links to websites on Leon Theremin and his wonderful instrument. I wasn’t expecting to add this post just yet, but I had a stroke of luck which has enabled me to complete the scheme for my mono mixing section which I started writing about when I described the Red Dragon the other day. I bought a job lot of small SoundLab mixers off eBay which were said to be faulty returns. I thought I might be able to salvage some parts from them, use bits of them in some way, or even repair them – but it turned out that several of them appeared to be in working order. Two of them were straightforward 4 channel mono mixers – an updated version of the one I had used before, I presume – so these were immediately used for the left and right channel inputs to the mono mixer, as I described in the previous post. Generally speaking, I wanted to have the lower tones to the left and higher tones to the right, so my ‘double bass’ stylophone was the first thing to be plugged into the left mixer; the treble stylophone and the SoftPot Stylophone in the right. More interestingly, the two other working units were the G105C version with ‘microphone effects’ – a delay circuit which I guessed was probably based on a PT2399. I opened up one of the dead ones, and found that this was the case. The circuitry was very different from the original SoundLab mixer I’d acquired – all surface-mount components; everything, pots and sockets included, firmly fixed to a single circuit board – and I’m not sufficiently skilled or equipped to be able to repair something like that. Not only was it not functioning, it seemed to short out the power when the on switch was pressed. I sawed out the part of the circuit with the PT2399 on it, which didn’t short the power when used by itself, but didn’t do anything to the input sound either. This section is permanently in circuit when the mixer is operating, so maybe that was why the original unit didn’t work. In any event, I decided to put the broken ones away for another day, and concentrate on the ones that worked. The case would find a use later on. First of all an echo unit is a really useful thing to have – and 2 echo units with 4 inputs is a bonus! My initial arrangement with these is to have the outputs connected to the new Left and Right Mixers. The left echo unit is used for instrument input and the output is divided: one half of the output going directly to the Left Mixer, the other half going to the right echo unit, and from there to the Right Mixer. As the delay time and feedback (number or length of repeats) are separately adjustable on the two units, some interesting stereo effects are possible. 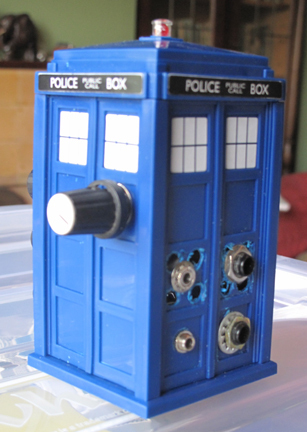 which is why it’s called ‘The Tardis’ – not because it’s a time-manipulation circuit, which would have been cleverer. 2. The tone control of unknown origin is unlike anything I’ve seen before or since – or, rather, since the heart of it is quite a high-value inductor, it most resembles a variable bandpass filter – a wah circuit – but is evidently not intended to be swept up and down like a wah wah pedal. 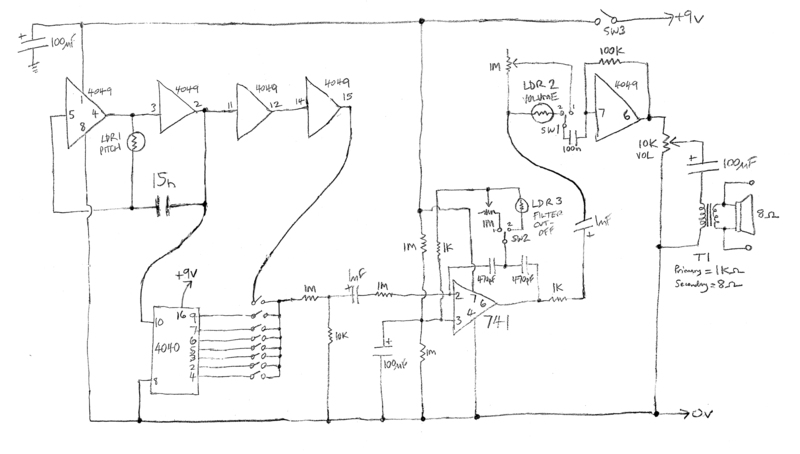 Another of my finds in a very old electronics magazine, it was originally called a ‘Passive Tone Control’, but the reduction in the volume of the input signal was so drastic that I added an amplification stage before it to boost the level to something like the original, and it became an ‘Active Tone Control’. Moving the single control from one extreme to the other varies the tone considerably, and it’s very useful with sounds rich in harmonics, like the various Stylophones in my collection. 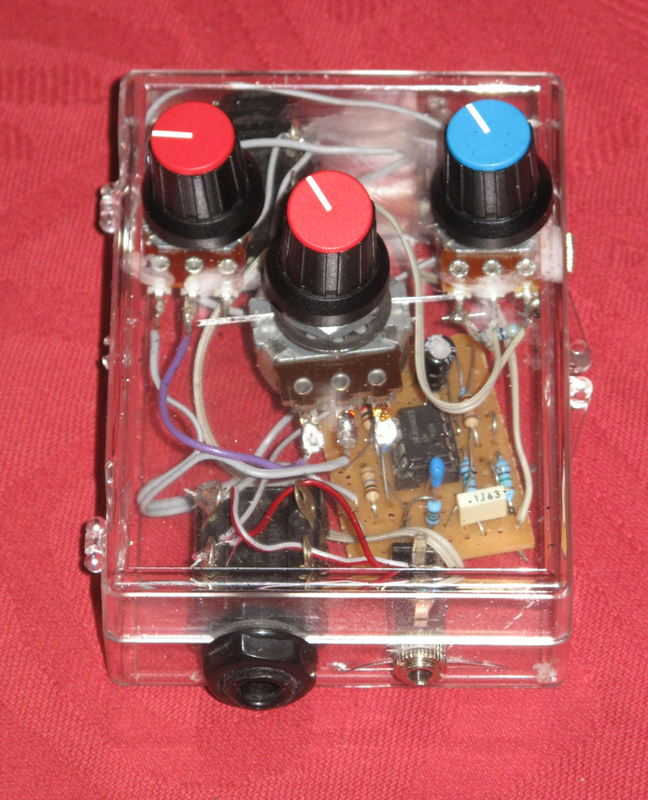 This was another project after the Touch-Radio which I housed in one of the transparent jewellery cases I had recently acquired. 3. 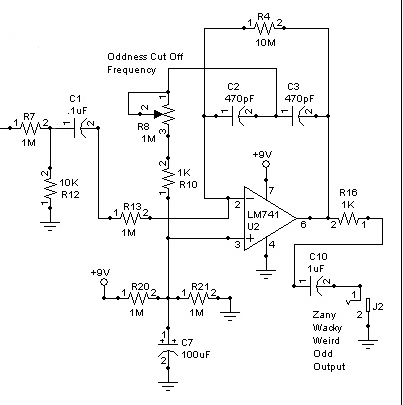 I’d heard nothing but praise for Ray Wilson’s simple 741-based low-pass filter – and indeed the whole ‘Wacky Electronic Noise-maker Thingy’ which it forms part of – so I decided to make one and try it out. In fact, I made two, and I’m glad I did, because they’re great! One of them went inside an Optical Theremin project, which I’m in the middle of, and which I’ll be describing as soon as I’m finished [Edit: the Opto-Theremin is described here]; the second one went into another jewellery box project. 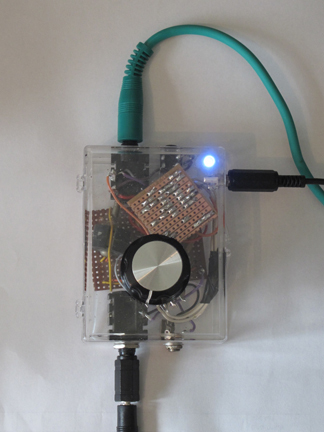 You can read about Your First Wacky Electronic Noise-maker Thingy here: http://musicfromouterspace.com/ – just look for links to ‘WSG’ and you’ll find it. In fact, I just looked at it again and discovered that the circuit there is a slightly more advanced version of the one I built, incorporating fine adjustment of the filter cut-off frequency and a resonance control: looks like I’ll have to go back and make some modifications! . . . Later on I may have to build the whole thing . . . Note in the diagram above the correct way to wire the cut-off frequency potentiometer. I used a logarithmic pot, because that’s what I happened to have, which exaggerated the effect of my error the first time I put it together of wiring the pot the wrong way round – no effect throughout most of the travel, then a huge effect in the last quarter-turn: wire it the right way round and you get the full effect through the whole travel of the pot. Adding a 100k pot, wired the same way round, in series with the 1M pot, at the end marked ‘1’ – which is what the slightly more advanced version includes – would help to make more precise adjustment of the tone. I should add that the whole Music From Outer Space site is an absolute mine of information and worth reading in its entirety: you can learn about synth modules, study circuit diagrams/schematics and buy circuit boards and so forth associated with the projects described. 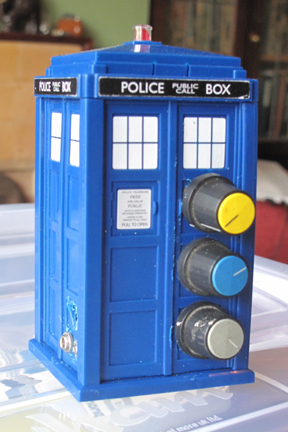 Once I get round to doing the modifications, I’ll add a comment or edit the post and show a picture of the finished article.